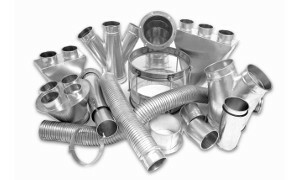 Vehicle/Engine Exhaust Industry Solutions - BISCO Enterprise, Inc. 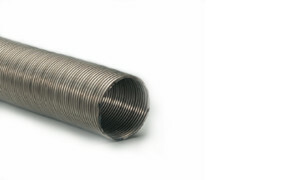 Vehicle and Engine exhaust is produced when an engine burns fuel and it's a lot more dangerous than most think. Exhaust emissions from a cold-start engine can reach toxic levels very quickly within an enclosed area. It's only a matter of minutes and because carbon monoxide is odorless, it can be hard to detect. Combustion engines can also act as an ignition source to flammable vapors and gases. 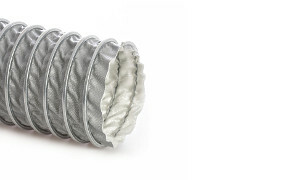 Exhaust fumes, particularly diesel fumes, are made up of thousands of particulates and gases such as benzene, arsenic, hydrocarbons, and DPM which are toxic to the air. 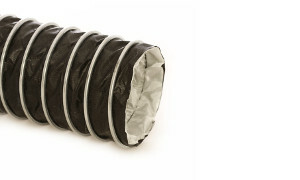 These fumes can instantly expose workers and penetrate their clothes. Exposed workers can experience adverse health effects including irritation of the eyes/nose, headaches and nausea, or something much worse like respiratory disease and lung cancer (many of these gases are known or suspected carcinogens). Also combustion engines can easily ignite when in an area with flammables fumes. Fumes can enter the engine with the air, sparks and flames can be discharged, or it can overspeed all of which can cause a devastating explosion. Controlling vehicle exhaust to reduce risks for your workers and facility isn't only the right thing to do, it’s the law. 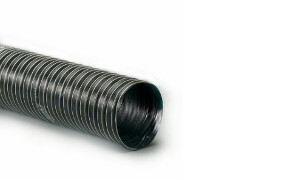 Single-ply, black acrylic coated polyester fabric hose reinforced with a spring steel wire helix. 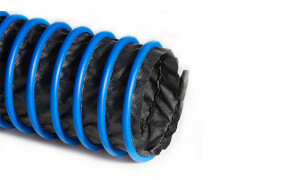 Double-ply black neoprene coated fiberglass fabric hose reinforced with a spring steel wire helix & external filament fiberglass cord. 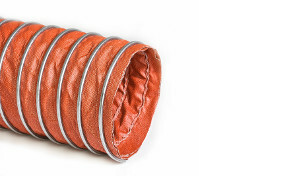 Double-ply fabric hose with a iron oxide red, silicone coated fiberglass inner layer and a black silicone coated Nomex® outer layer. 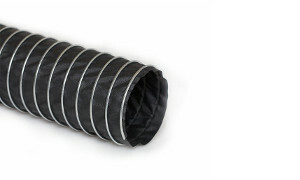 Single-ply, black, neoprene coated polyester fabric hose mechanically crimped in a continuous process. 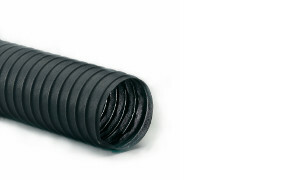 Single-ply black neoprene coated polyester fabric hose mechanically crimped in a continuous process with a non-marking thermoplastic rubber clip cover. 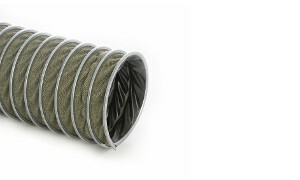 Single-ply green Para-Aramid fabric hose mechanically crimped in a continuous process. 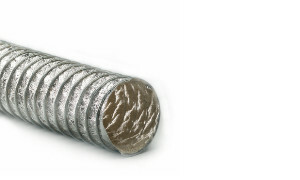 Double-ply, silver construction, silicone coated fiberglass fabric hose with a silver heat-resistant fiberglass liner. 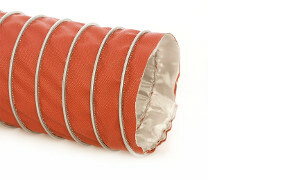 Double-ply red wire inserted fiberglass fabric hose with a silver heat-resistant fiberglass liner mechanically crimped in a continuous process. 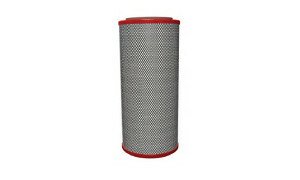 Double-ply, red wire inserted, fiberglass fabric hose mechanically crimped in a continuous process. 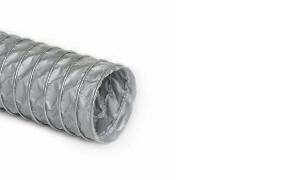 Double-ply construction, black Teflon® fabric hose with a silver heat-resistant fiberglass liner mechanically crimped in a continuous process. 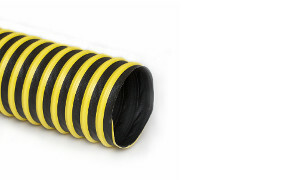 Double-ply black neoprene coated polyester fabric hose reinforced with a spring steel wire helix & yellow external PVC coated polyester wearstrip.